Follow the Seine to coastal Normandy on a journey that's sure to impress. Cruise to Rouen and Giverny, immortalised by Impressionist artists. Visit D-Day beaches, sample Calvados where it is made before returning to Paris. DAY 4 VERNON It’s said that you can hear the beams creaking like old bones when you see the Vieux Moulin de Vernon. The mill straddles between the pillars, seemingly suspended in mid-air over the Seine, while its roof sags like an old worn-out horse. Claude Monet painted the mill, and reassuringly, the sag is visible in these paintings, which date back to 1883. Vernon has a few sights, such as a Gothic abbey church with stunningly colourful stained-glass windows. Nevertheless, it’s almost impossible to resist the lure of excursions to nearby destinations. In Château de Bizy (also known as “Little Versailles”), you can revel in the luxurious Renaissance décor and go for a delightful stroll around the elegant park. Claude Monet’s house in Giverny is another magnet for culture enthusiasts and romantics – and rightly so. Unsurprisingly, the lush garden looks like a wild field of flowers from an Impressionist painting. The crowning glory: the enchanting pond of water lilies, the subject of one of the most valuable paintings in the world. DAY 5 PARIS is a city whose beauty never fades. The Arc de Triomphe, Notre-Dame, La Madeleine, Opéra, Louvre, Sacré-Coeur de Montmartre, Dôme des Invalides and Centre Pompidou are just some of the sights exemplifying this city’s fame and grandeur. But in addition to these outstanding attractions, there are many other wonderful things to see. Enjoy some old Parisian charm in the tiny lanes of the artists’ quarter, Montmartre, and the Jewish quarter, Marais. Or, for a true taste of Parisian joie de vivre, soak up some sun in one of the magnificent parks or on the beach by the Seine. 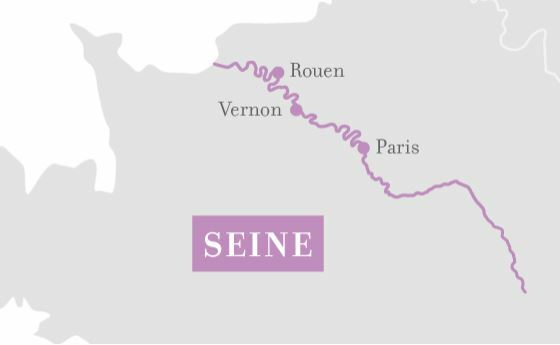 The Seine’s curved path through Paris is 13 km long, and from the ship you’ll get a good overview of some of the most important sights. For bookings made by 28 February 2018 for all departures between April and September and made by 31 August 2018 for all departures in October and November 2018.